Smith & Wollensky is a landmark restaurant in Las Vegas and many other cities in the country. This fine establishment offers the opportunity for wine and food lovers to partake in several wine dinners and events throughout the year. We had the great fortune to enjoy a culinary and wine experience featuring Lancaster Estate Wines from the Alexander Valley. The dinner featured five courses paired with the Lancaster Estate wines which the National Sales Director, Chris Venello, took us through with each perfectly prepared dish. Savingnon Blanc. This wine held wonderful citrus and melon notes and a nice full complexity. This unfined and unfiltered wine was aged 7 months in 90% stainless steel barrels and 10% in new french oak barrels. As the evening continued we were in for more culinary sensations. Our taste buds where satisfied and our palettes enriched with the sumptuous food and wine that Smith & Wollensky along with Lancaster Estates wines provided for our enjoyment. Lancaster Estates is estate grown, bottled and produced wines that honor and reflect their origins. The Estate is located at the southernmost tip of Alexander Valley, and includes 53 hillside acres of vineyard surrounding the winery. Situated near the confluence of the Knights Valley and Chalk Hill appellations, this location offers a great diversity of soils and micro-climates and the optimum growing conditions for Bordeaux varieties. The Estate has warm days and cool nights, and a longer growing season than other Cabernet-driven appellations. As a result, these wines express their rich, ripe flavors with bright vibrancy and balance. VINO LAS VEGAS invites all of our readers to join Jeremy Wilkinson on a tour of South Africa ! This exclusive tour, led by Jeremy Wilkinson, “Wine Coach” of 4 Wines plus more will include several unprecedented visits to a carefully selected handful of some of the country’s most exclusive wine estates. Offering both enthusiasts and wine industry professionals a unique look at South Africa's internationally acclaimed and award winning wine country in a way not normally possible, including private cellar tours and dinners hosted by the wine makers! While in Sun City, you can also experience all the savage beauty of the African bush and the many animals in their natural habitat. The Van Loveren Estate in Roberston, where you will get a private tour and tasting, as well as lunch hosted by the Van Loveren "Retief" family! The tour also includes a luxurious stay in Stellenbosch, considered the Napa of South Africa, at the Lanzerac Estate. Lanzerac, established in 1692, is famous not only for its wines, but also for its 5 Star Restaurant and 5 Star hotel, set in the most magnificent surroundings. This is a true jewel of a vineyard, as it boasts one of the most modern wine cellars in the cape and is nestled in beautiful Stellenbosch. Guests will visit Landskroon Estate where you will get a private tour of the Estate and wine tasting hosted by the wine maker Paul de Villiers! Clos Malverne Estate Tour, Wine Tasting & Dinner – a “Traditional Braai” (BBQ) Dinner @ Clos Malverne Estate, Stellenbosch, hosted by the Family! There will also be excursions into vibrant Cape Town and along the coast to the Cape Peninsula are included, as well as a three night stay in Sun City at the Palace of the Lost City (South Africa’s Bellagio). Accommodations are absolutely first class throughout the stay, including gourmet dining at some of the best restaurants in South Africa. There are other people offering trips to different wine regions but this is a very unique opportunity to be escorted by Jeremy who many consider to be an expert in this wine region of the world. 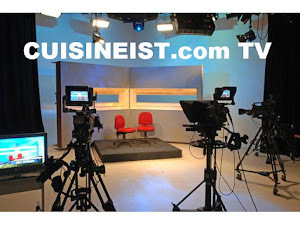 Stop in to his site and take advantage of this opportunity. And don't forget to tell him you found out about the trip right here on VINO LAS VEGAS ! Have fun. As many of our regular readers know we have visited Marche Bacchus many times in the past. Its been almost a year since owners Jeff and Rhonda Wyatt took over the reins of this well known and award winning restaurant so we here at VINO LAS VEGAS dropped in for dinner and some great music to see how they were doing. There have been many changes at Marche Bacchus over the last few months. 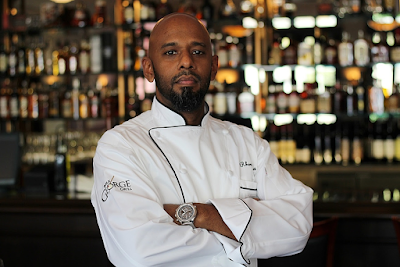 Chef Jean-David Daudet joined Marche Bacchus as their Chef and has added his own signature to the Marche Bacchus menu with delicious daily specials. Chef Daudet is from from the Burgundy region of France, where he owned and operated his own acclaimed restaurant, Le Trou Poinchy, for twelve years before moving to Las Vegas as the Executive Chef for Drais at the Barbary Coast. Daudet began his career training under Marc Meneau of L'Esperance " long known as one of Frances culinary institutions. He spent four years with Meneau as his 2nd in command, and another five years combined as chef at the Michelin starred restaurants La Bergerie and La Gaichel in Luxembourg. restaurant than just the food. "Marche Mondays"gives dinners and wine lovers alike great discounts on food and wine. One of the newest additions is "Jazz Under the Stars" held every Wednesday where you can listen to great Jazz and enjoy the view as the sunsets over the lake. The long held tradition of Saturday wine tastings is still going strong and well attended. It is always a pleasure to have lunch or dinner at Marche Bacchus. Jeff and Rhonda Wyatt have made significant changes to their restaurant while still keeping to its old traditions. With the addition of their "mister" system we can enjoy the outside patio year around. Jeff and Rhonda have great plans for Marche Bacchus and we will be their to see what they do next ! We haven't spoken about a wine in a while as we have been on the road for quite some time. 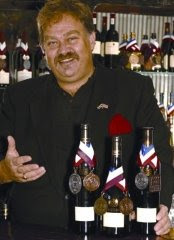 You can find Vino Las Vegas at Rosemary's Restaurant quite often. 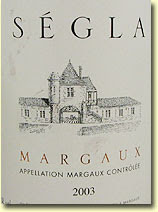 On this visit we enjoyed great food and a spectacular Chateau-Rauzan Segla 2003 from Margaux. As we turned the pages in their wine list the words "second growth" jumped out at us and made our wine selection very easy. The chateau takes its name from Pierre des Mesures de Rauzan who purchased it in 1661 and developed it into vineyards. It was accorded Second Growth status in the 1855 Classification of the Medoc. In the original distribution of the 1855 Classification, Chateau Rauzan-Segla was listed 6th, just behind the four First Growths and Chateau Mouton Rothschild. Frederic Cruse purchased Rauzan-Segla in 1903. He invested heavily and made many improvements. He is responsible for the building of the house and for the complete replanting of the vineyards and renovation of the facilities. Since 1983, it has resumed its position as a premier producer and worthy of its rank. That was due to the involvement from that year by Jacques Theo who became involved with the chateau's operations and wine making. He brought in a new cellar master, built a new wine making facility (chai), and also made adjustments in all aspects of the wine production from vineyard, grape selection and barrel selection. Rauzan-Segla is owned by Château Rauzan-Ségla S.A. which is a subsidiary of the Chanel Group. This ownership change took place in 1994. This ownership has once again invested in the property and is keeping it in top shape. The wines are placed in oak barrels for 18 months of aging after fermentation. 50% to 60% of the barrels are replaced each year. The percentage of new barrels can vary slightly as the winemaker determines the amount of oak influence that is best for the particular vintage. The oak used by Chateau Rauzan-Segla comes from the Troncais forests of France. During the aging period, the wines are racked every 3 months to remove sediments. Once barrel aging is complete, the wines are fined with egg whites in the traditional manner before bottling. On the nose we had hints of nuts , earth and smoke. The palate was amazing with red fruit and cassis along with a firm core of tannins on the finish. This lovely Bordeaux is worthy of its 92 points and went well with red meat and even Chef's special scallops. We could not think of a better match than Chef Michael Jordan's creations at Rosemary's and this 2003 Bordeaux from Margaux that seemed to get better with each sip.